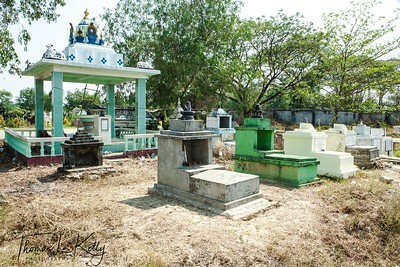 Hindu Graveyard. The ones with Shiva Lingas are where Sadhus, Hindu Saints are buried in lotus position. Myanmar. 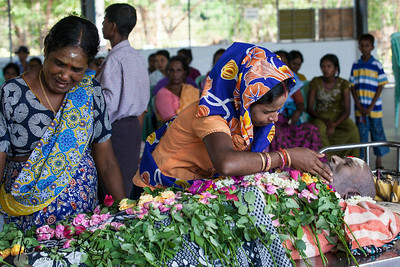 Grieving family members offer fruits and flowers to the God who takes care of the deceased afterdeath life. 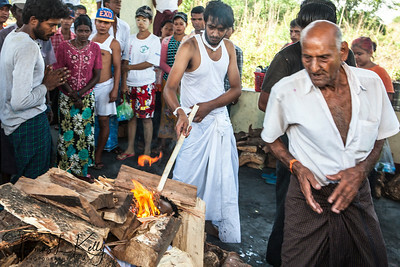 Hindu Cremation & Funeral, in Myanmar. 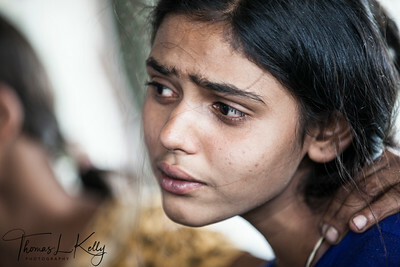 Grieving family. 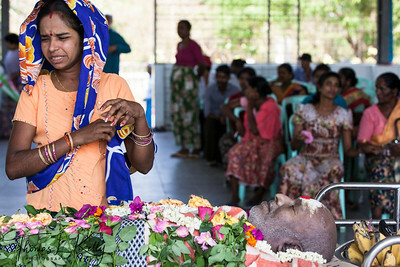 Hindu Cremation & Funeral, in Myanmar. 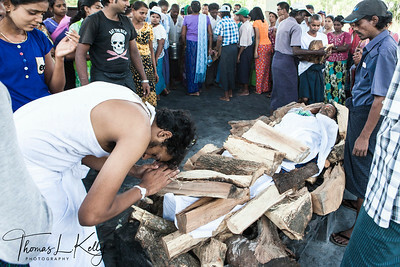 Eldest son of the family performs death rites of his father at cremation site. Myanmar. 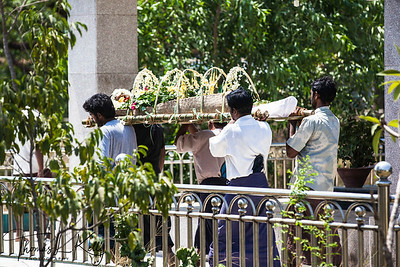 Carrying deceased family member to funeral ground. Myanmar. 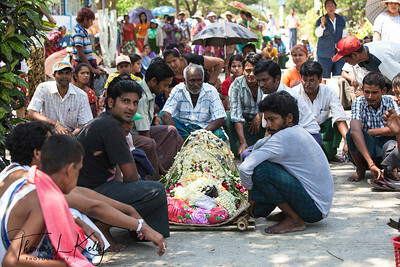 Hindu Cremation & Funeral, in Myanmar. 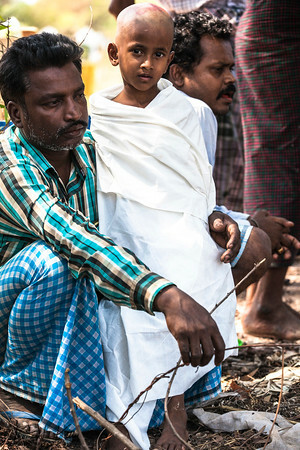 According to Hindu culture, a Person must wear white and shave head when performing last rites for his family. Myanmar. As the conclusion of rite, a person performing rites carries a clay pot of water on the left shoulder. Another person walks behind with a sharp iron instrument. Both of them go around the coffin anti-clockwise three times. When the person carrying the pot reaches the head each time, he stops for a second or two, and the one with the iron instrument hits the pot gently to make a hole so that water flows out from the hole. The first hole is made at the bottom of the pot at first round, the second one at the centre above the first hole at second round and similarly at the end of third round the final one at the top, above the centre hole. This water is splashed with the back of the left hand onto the corpse by the person who follows. This procedure is repeated till three holes are made. 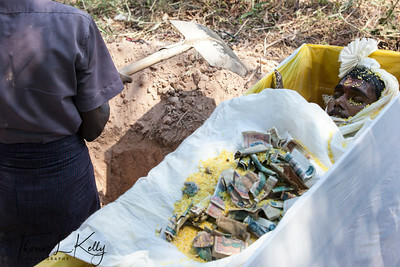 At the third round, the pot is dropped behind the person carrying it. He walks away without turning back or looking at the body. Myanmar. 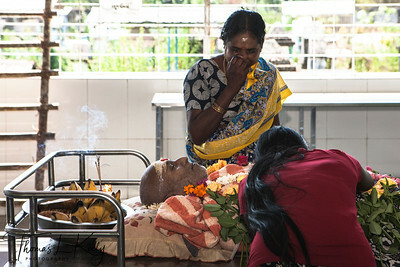 Last rites; offering rice and flower to deceased before cremation. Myanmar. 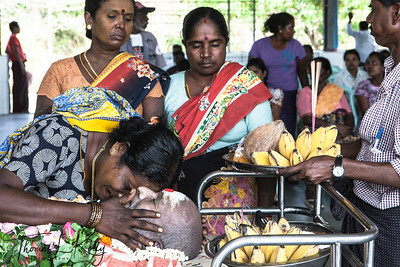 In some Hindu last rites, tradition is to put chicken on deceased's head if death day is Saturday. Myanmar.